Shred Wise is Orange County’s best choice for commercial shredding services. Whether you need a one-time purge of your sensitive documents or ongoing, regularly scheduled shredding, we offer secure and reliable document destruction services at highly competitive rates. Our shredding can be done on site or off site, and we guarantee 100% destruction and recycling of all the paper we shred. We also offer customizable and flexible shredding programs with no long-term contract required. Our exceptional paper shredding services have earned us thousands of satisfied clients over the last eight years, a stellar reputation, and excellent reviews on Yelp. 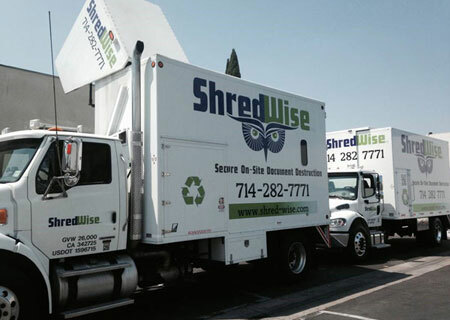 No matter the size or industry of your business, outsourcing your shredding needs to a locally-based, Orange County mobile shredding company like Shred Wise comes with a wide array of benefits: It is generally less expensive, more secure, and less time consuming than doing it all in house. At Shred Wise, we use some of the industry’s best mobile shred trucks and supporting equipment. Our shred trucks feature a shredding capacity of 6,000 pounds per hour; an onboard shred camera so our clients can watch the shredding of their documents; and a fully automated curbside lift system for hands-free emptying of your bins. We also offer customers who sign a service agreement free use of our lockable shred consoles and rolling bins. By placing shred containers throughout your office, you’ll not only ensure that your sensitive information is stored securely between service visits, but also make it easier for your employees to properly dispose of these documents. When you are ready for us to visit, one of our carefully screened employees will arrive as scheduled, empty your shred consoles into a locked rolling bin and take all bins outside for immediate destruction. You are welcome to witness the destruction and will always be given a Certificate of Destruction when the job is complete. Once the paper is shredded, it will get mixed with hundreds of pounds of other shredded paper for dilution and then be taken to a recycling facility. In the event that your business needs a one-time purge of documents, we can usually accommodate same-day or next-day onsite shredding requests in Orange County because we keep all of our service routes local. Alternatively, we can dispatch our secure panel truck to your office to pick up your paper and bring it back to our facility for immediate shredding. Family-owned and -operated, Shred Wise is NAID-compliant and stays up-to-date with the industry’s best practices. All of our shredding and business practices are based upon their strict paper shredding guidelines. We are also committed to their Code of Ethics, which includes abiding by all local, state, and Federal privacy laws and regulations, and taking the necessary precautions to protect the confidential nature of our clients’ records. If you are interested in learning more, call us today. Our experienced and knowledgeable staff is available seven days a week, and happy to provide you with an over-the-phone quote as well as free advice on how to comply with FACTA, HIPAA, and other privacy laws relevant to your specific business. Call today for more information on how you can protect your Orange County business, employees, and customers from data breaches, identity theft, and accidental disclosures.